READY TO MOVE-IN NOW !! – 410 Lofrin Rd. Anderson Homes has been building dreams just like yours since 1981. Over 600 of them. It is our endeavor to build your dream as if it were our own—leveraging your purchase power by negotiating better prices for materials and services, involving you at the center of all decisions to the extent you want to be involved, and ensuring your home is built for your vision, your lifestyle and your budget. It is our uncompromising integrity and quality that have earned us the highest satisfaction rate in the County–validated by being voted Best General Contractor each year since 2015. But don’t let us tell you. See what our customers say here. Anderson Homes has built more than 600 homes throughout the Olympic Peninsula. 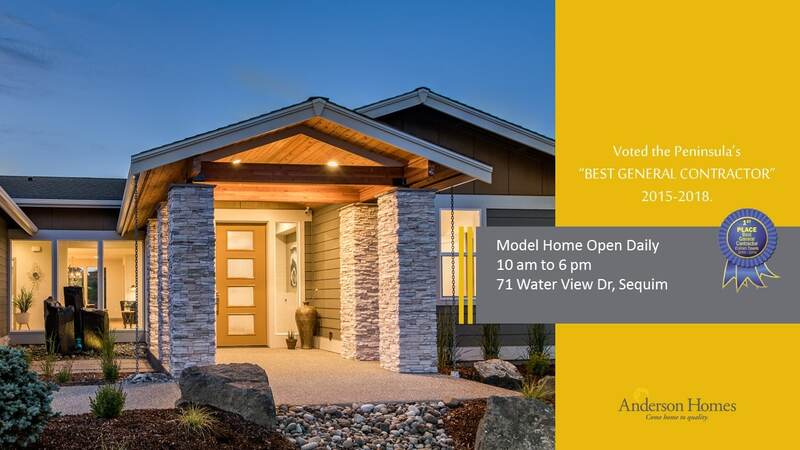 As Sequim and Port Angeles’ largest home builder, our uncompromising integrity and quality have earned us the highest satisfaction rate in the county. Our craftsmanship, value, and service have helped us become one of Puget Sound’s most trusted builders; our reputation and commitment to the community have made us a neighbor.